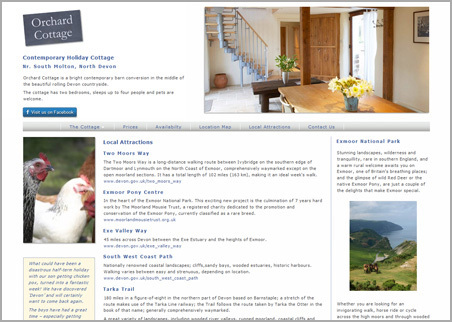 Devon Cottage is a contemporary holiday cottage near Exmoor in Devon. The web site includes a full booking and payment system as well as content management enabling client update of all content. Availability of the cottage is updated automatically when bookings occur, or can be marked manually. Availability for future dates only is displayed on the front end of the website. Prices can be set for bookings according to time of year and into the future.